BOOK NOW & SAVE WITH SPECIAL INTRODUCTORY RATE!!! Welcome to the Arcadian Grove, loft style living on the edge of the Olympic National Forest! This above garage studio for two is nestled in the trees, providing a peaceful & relaxing stay. Newly remodeled, this space is inviting both inside & out & provides everything you need for a getaway to the beautiful Olympic Peninsula. Vaulted ceilings adorned with wood beams give a feeling of spaciousness. Comfy queen size bed, full bath with walk in shower, dining area, & work space. The fully stocked high-end galley kitchen has all essential cookware & offers full size electric range/oven, dishwasher, microwave, & mini fridge. Viewing deck off the living space overlooks the pristine grounds and protective circle of timber. Curl up on the leather loveseat to watch your favorite movies, or try your skills at one of the many available board games. Amenities include DISH TV, WI-FI, private washer/dryer located downstairs, & garage parking. 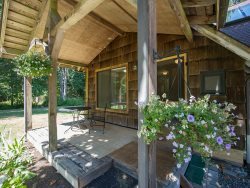 With quick access to downtown Sequim, this property is also near the Olympic Discovery Trail, Sequim Bay State Park, John Wayne Marina, the Olympic Game Park, & many great trail heads to venture out into the Olympic National Park. Enjoy sitting fireside on the lush lawns surrounded by towering trees & foliage after a day of hiking or exploring. There is so much to do, with the ferry to Victoria, BC only a half hour away (bring your passport), the awe-inspiring Crescent Lake and the Olympic Lodge less than an hour away by car. Planning on traveling with friends or family? This is a shared property with a larger rental home next door, which is also available for renting should you be in need of space for a larger group. See 'Mystic Grove' for details. Whether you are considering a short term stay, or monthly in the off season, this property is a great option for both.